The early autumn air whisked our cheeks with a little shrug the cool was a back note. The sky dark no crack of light to guide the way. 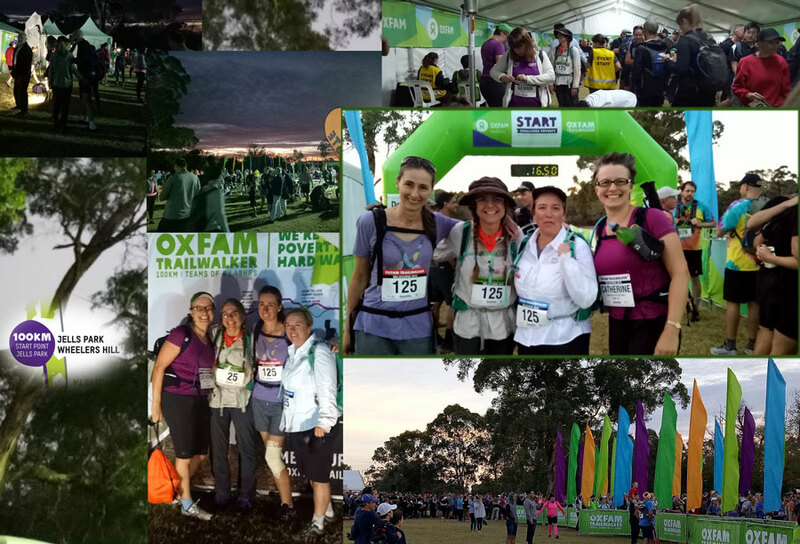 The Famous Four Oxfam walkers and I huddled into a tin can, packed to the rafters, we hurtled down the highway making the 6.30 am entry time for the seven thirty start . There was an air of expectancy and quiet in trepidation as we approach the busy dark treed full car park. The tin can, emptied quickly as the Famous Four grabbed their packs and walking sticks. Lights and noise were beaming in the distance marking our way to the start line. Hopping over a few logs we arrived at the long-anticipated moment. Last October the Famous four started training ever increasing their distance, pace and their load. I am so proud of them a motley crew. An artist, a nurse, a lawyer and a risk manager known to each other by the events they participated in, in their local area, of Coburg North. Quarter way point days are sunny life is gay. 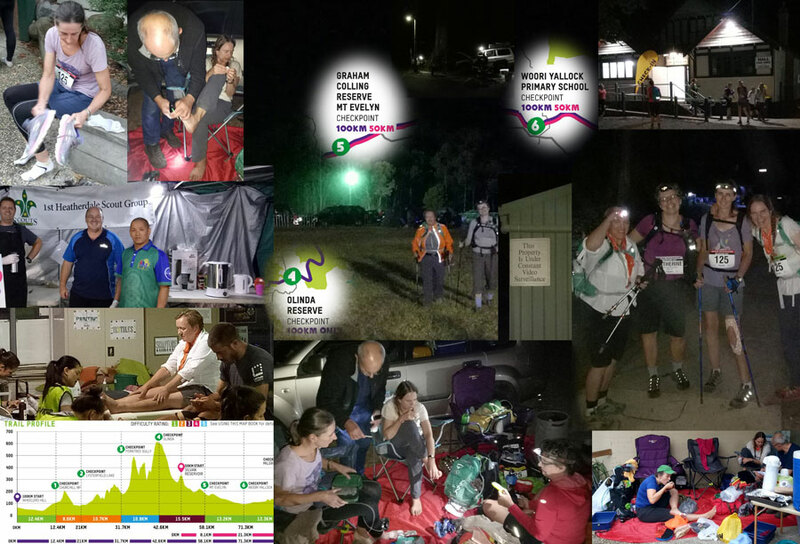 The support crew 2 by 2 ‘check point Charlies’ were with every step they took meeting their needs to sustain them to the finish line. 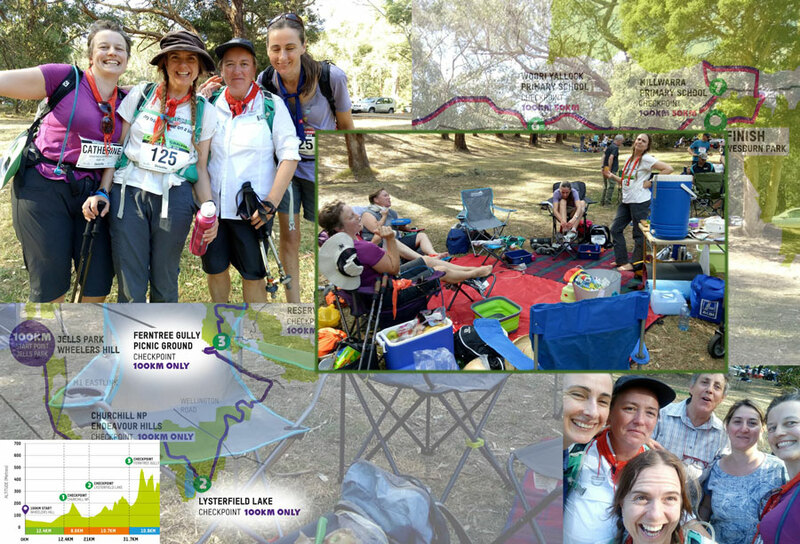 We unpacked nurtured repacked and sped to the next checkpoint to repeat the process. Halfway point night trekking with one hours sleep. The swap over of was on a hill in Warburton, a sleepy river town. The children of the Famous Four were waiting anxiously for their mothers return. While waiting, they created a cubby, dug a mine pit and developed new drainage system in the rainy weather. Many a muddy boot lined the doors entrance as we would return to restock and swap over. 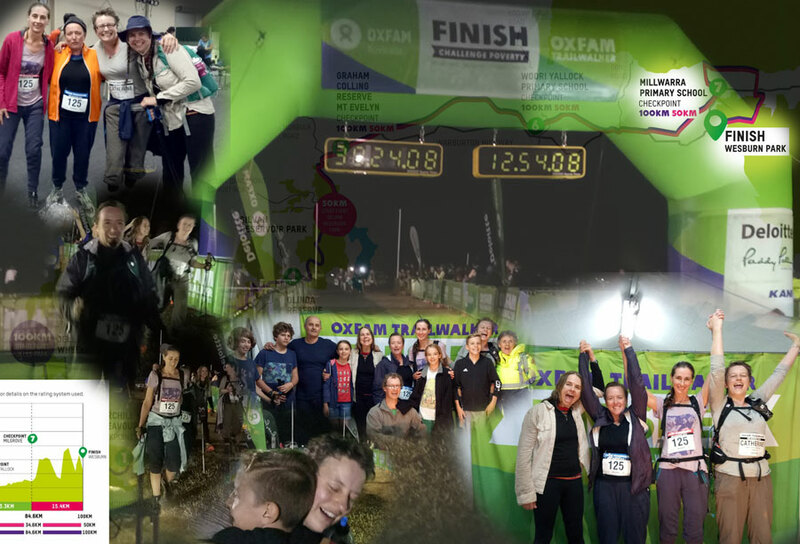 The Famous Four crossed the finish line after battling storms, wind, heat and torrential rain. The photographs taken by the support crew they tell a part of the story no doubt as the walking artist recovers more drawings will emerge. By a ‘check point Charlie’ for their friends and family.